There are few small TVs as smart as this, with the intuitive combination of My Home Screen, and Freetime and its roster of all UK catch-up TV apps. However, a lack of power makes Freetime no fun to navigate, while the screen only middling contrast and some motion blur. Until the technology's moth-balling late last year, Panasonic was the king of plasma. Its bigscreen TVs were better than anyone else's – just see our reviews for proof of that – but sales were presumably poor. In 2014 it's now competing, not with picture quality, (the 32-inch TX-32AS600 is merely average judged on on-screen images) but with apps and usability. The TX-32AS600 may be a middle-of-the-road LED-backlit LCD TV, but it does have something unique: Freetime. A new-on-the-scene rival to YouView, Freetime is a separate, but well integrated, user interface that gives you a TV guide that can be scanned through both forwards and backwards, unlocking on-demand content from a range of catch-up TV apps. For UK users this means easy and quick access to apps like the BBC iPlayer, ITV Player, Demand Five and 4OD (as well as to BBC News and BBC Sport). 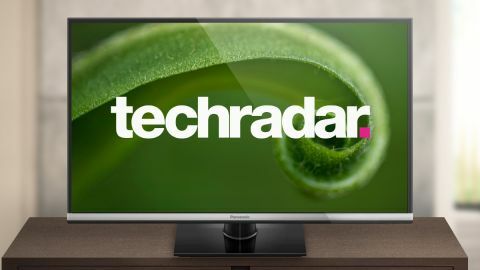 Selling for around £400 at the time of writing, the TX-32AS600 is a mid-range LED-backlit LCD TV. Though it boasts some distinctly low-end build quality (it's just so, so light – a mere 6kg), it looks a picture; a neat metallic strip along the bottom measuring 18mm lends some class to an otherwise ordinary looking gloss black frame. At a mere 5mm on the top and sides, there's a minimalist look to the TX-32AS600. Just as well, because the TX-32AS600's chassis is rather chubby at 59mm deep (it measures 733x505x184 mm with the desktop stand attached). Elsewhere, the TX-32AS600 features a Full HD resolution IPS panel and 100Hz processing. Around the back you'll find an impressive trio of HDMI inputs (one of them ARC-compatible), an RGB Scart, a set of component video inputs and an Ethernet LAN slot (though the TX-32AS600 also features Wi-Fi). Also back there is an RF aerial input to fetch Freeview HD channels, a digital optical audio output for routing all sound to a home cinema system (and away from its own rather weedy down-firing 10W stereo speakers), and a set of left-right phonos. A side panel immediately beside adds a headphones slot (nicely ranged towards the bottom to make it easy to access) alongside a Common Interface slot and a couple of USB slots. The latter connections power the TX-32AS600's Media Player software, though it also includes Media Server software for fetching digital phones music and videos from a Windows PC using DLNA networking. More important to most users are My Home Screen and the TX-32AS600's choice of apps. The former, first seen on high-end Panasonic TVs last year, puts shortcuts for various TV functions around a large screen for live TV. These shortcuts include bookmarks for the TX-32AS600's built-in web browser, apps and links to the TV's media player software. There's also a dedicated screen for Freetime that complements a large live TV picture with related shortcuts to on-demand content, a TV guide, a search function and a Showcase recommendations area (which is based on what you watch, though it wasn't yet live at the time of this review). As well as having the BBC iPlayer, ITV Player, Demand Five and 4OD apps wrapped-up inside Freetime, the TX-32AS600 also features a plethora of apps. Accessed via My Home Screen, the BBC iPlayer app is again present, as are both BBC Sport and BBC News. However, the real star turn is Netflix, which is provided alongside YouTube, Wuaki.tv, Meteonews TV, Eurosport Player, CNBC Real-Time, Skype, Euronews, Facebook, Twitter and AccuWeather.com. A dozen more minority apps are available to download for free from the Panasonic Apps Market. The Panasonic TX-32AS600 is the smallest member of the AS600 Series of LED TVs, the others being the 39-inch Panasonic TX-39AS600, 42-inch Panasonic TX-42AS600 and the 50-inch Panasonic TX-50AS600. A step-down from the TX-32AS600 is the brand's 32-inch TX-32AS500 and 32-inch TX-32AS400, which don't feature Freetime, My Home Screen nor Full HD resolutions. However, the TX-32AS500 does include Netflix and the BBC apps on its now rather dated-looking VieraCast interface.